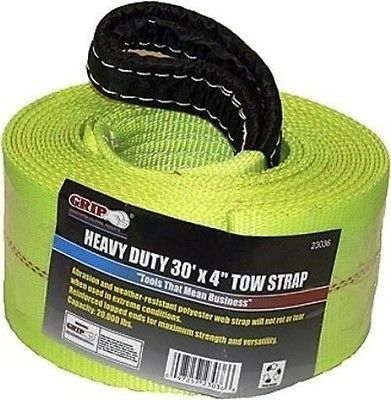 23036G GRIP 4" x 30' Heavy Duty Tow Strap Working Capacity: 6,666 lbs. Abrasive and weather resistant polyester web strap will not rot or tear when used in extreme conditions. Reinforced looped ends for maximum strength and durability. Breaking capacity: 20,000 lbs.